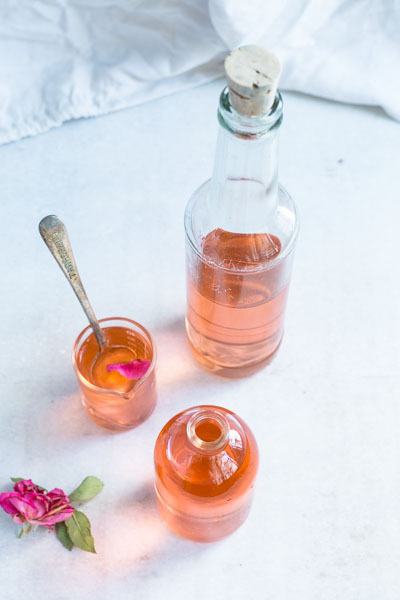 Have you tried making flower syrups? Context: My friend and I volunteered at the Auroville café for a few weeks in 2015. Aside from their freshly baked goods and wholesome meals made with the freshest produce, they served fruit and flower syrups (mixed with water/soda water) : hibiscus, kumquat, lemon, ginger, sarsaparilla root, and butterfly pea flower (which was very aptly called ‘divine consciousness’). I had some butterfly pea flowers growing in the garden at the time and had grand plans of picking and making some syrup when I got home. Truth is, I never made it past the planning stage in that process. But going by how fun and rewarding making this rose syrup was, I think it’s safe to say that this is the first of many to come! A couple of months ago when the roses were in full bloom in the garden, I used them to style some pictures for Ayca (check them out if you haven’t already). I then picked off the petals that I could salvage and froze them in ziplock bags for later use. 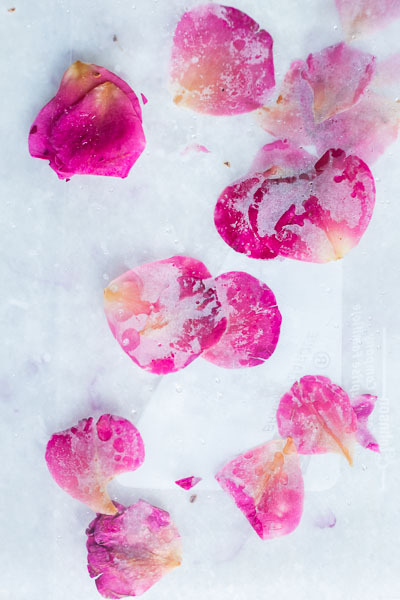 I wasn’t sure what I was going to use them for (I’d completely forgotten about the flower syrups by this time), but I didn’t have the heart to throw them away and thought, worst case, frozen petals make for some really cool pictures at the very least (proof below). I went with it. Paneer soda is an Indian drink that is essentially sugar syrup mixed with (artificial) rose essence and soda water. It’s refreshing with a delicate rose flavour coming through, but the downside—apart from the artificial essence part—is that I’ve always found it a little too sweet for my liking. 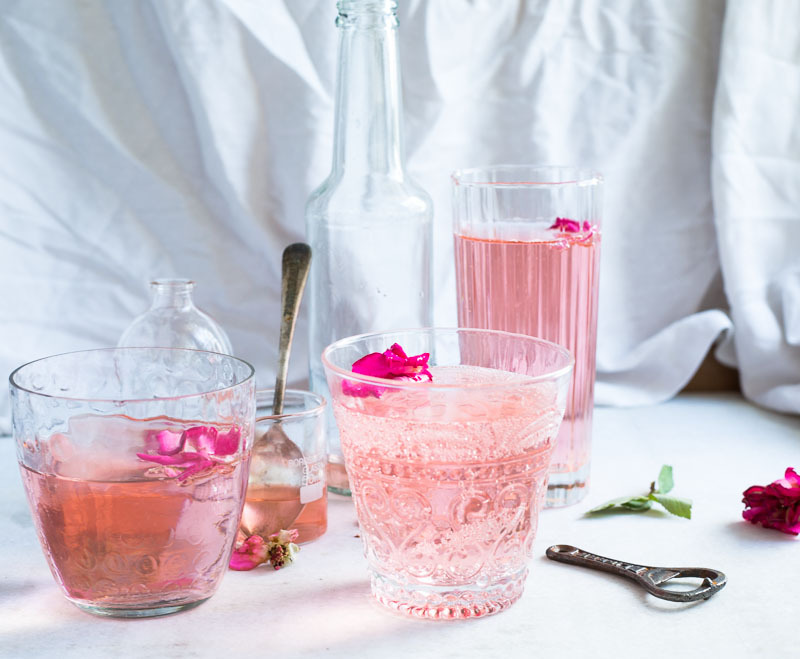 But, BUT, what if you made your own rose syrup? It’s a game changer. As a result of this little experiment, the rose bushes are almost always in a denuded state but that’s a compromise I’m willing to make. * I have noticed that some rose petals (depending on their colour and variety) don’t leach out too much colour into the syrup. They will, however, still taste very good. If you’d like to stain the rose syrup, adding grenadine or a few bruised pomegranate arils will do the trick. They might however alter the taste slightly. 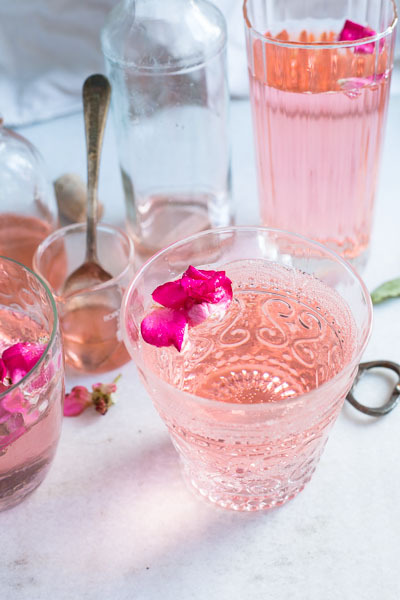 First make the rose syrup: Combine rose petals, sugar and 1 cup of water in a saucepan. Bring to a boil and whisk until the sugar dissolves completely, then turn down the heat to a low simmer. Cook for 15-20 minutes stirring occasionally. Take the pan off the heat and let the syrup cool to room temperature. 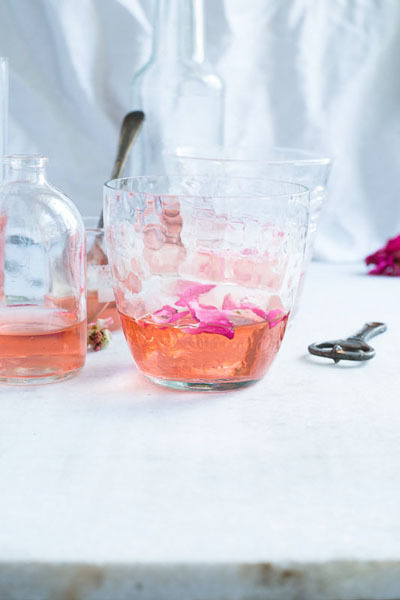 Strain and discard the rose petals and decant the syrup into a glass jar. Refrigerate until ready to use. 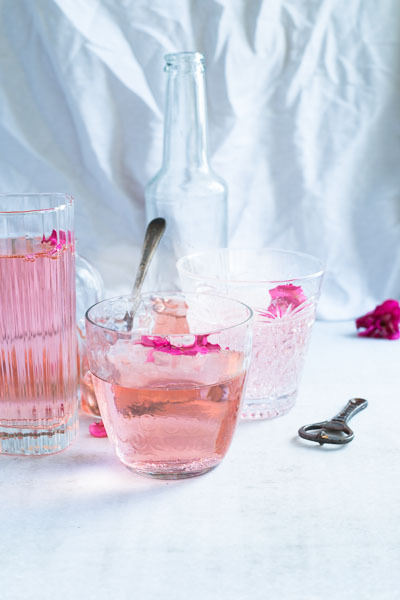 To make the rose soda, divide rose syrup between glasses (start with 2 tbsp and add more to taste) and top with chilled club soda and ice cubes. 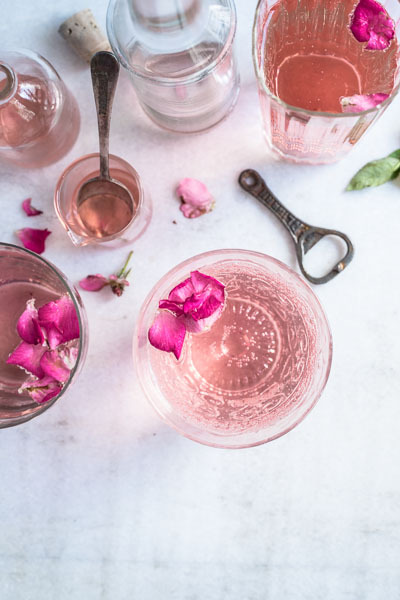 Garnish with fresh rose petals and serve immediately. - This rose syrup keeps well in the refrigerator for up to a week. - I have noticed that some rose petals (depending on their colour and variety) don’t leach out too much colour into the syrup. They will, however, still taste very good. If you’d like to stain the rose syrup, adding grenadine or some bruised pomegranate arils will do the trick. They might however alter the taste slightly.